TVS and Sherco have been tearing up the international rally circuit ever since their first collaboration for the 2015 Dakar. And to their credit, they’ve seen a fair bit of success, especially this year with wins at Baja Aragon and the PanAfrica Rally. TVS Sherco’s Abdul Wahid Tanveer also managed a second place finish in the Enduro category of the Rallye du Maroc (Rally of Morocco) - the same rally we were brought to Morocco to witness, at least a small part of the last liaison stage that is. But I digress. The main reason we were in Morocco was to sample a wide selection of Sherco’s dirt bikes, and even get a few minutes with their racing machines on the incredible sand dunes of Merzouga. The first riding session of the day was spent aboard the above-mentioned 300 SCF - a bike which I honestly am not really equipped to review. This 303.68cc single-cylinder cross-country machine is such a departure from anything I’ve ridden in the past. Sherco doesn’t mention anything about power figures, but we highly doubt it makes more than 45 horses. That might not sound like much, but paired with its ultra-low kerb weight of just 102kg, it’s responsive as hell. This responsiveness was vital for keeping a dirt/sand newbie like me upright on the bike, because as long as I was able to keep the throttle even a little bit open, the front, though weaving about like crazy, refrained from digging into the sand. And the extremely knobby full dirt-spec tyres provided an exceptional amount of grip in the sand. The only thing that was really holding the bike from floating across the sand dunes was my lack of ability. The 6-speed close-ratio transmission needed to be worked quite a bit to keep the momentum going. Often, I found myself in a gear too high when climbing up the slightly larger dunes, forcing me to take a wide sweeping arch and descend back down, or risk a stall and another embarrassing fall in the sand. To say it was hard work is an understatement, and my lack of experience and fitness saw me just collapse in a chair upon our return to the bivouac after just 20 minutes of riding. Now even for me, it’s almost impossible to tell the 450 SEF apart from the 300 SCF. They’ve got identical fully adjustable KYB suspension, 21-inch and 18-inch wheel configuration with knobby tyres, a crazy 355mm of ground clearance and a whopping 950mm seat height. The only visual differentiator here is that the 450 comes with a tiny headlight up front. Of course, the engine is larger and it makes more power and torque (again Sherco refuses to say how much), and the bike is slightly heavier at 109kg. Open the throttle and the difference becomes obvious. Unlike the 300, here I could happily stay in second gear climbing up the dunes, as there was more than enough to compensate for my riding abilities, or rather lack thereof. And that’s when it happened. After successfully jumping a couple of tiny sand dunes (mounds? ), I was following our lead rider as he jumped up a third. Somehow, I thought it’d be a good idea to not follow his track through the sand to keep the front wheel from weaving too much - the cleaner, trackless slope looked more attractive. But the sand banks in the midday sun can be deceptive, and the climb I hit was so steep, that I literally hit it… and went flying off the bike, landing chest first in the dune. Winded, dazed, embarrassed, with a face full of sand inside my helmet, but thankfully unharmed (the desert can be forgiving that way), the 450 served as a reminder to never get cocky when riding on such a demanding surface. This time around, getting back on the bike took a lot more effort, but the payoff was that much higher. There was more caution for sure, but surprisingly there was renewed enthusiasm as well, as the 450 climbed up taller dunes, some with even 5-6 foot vertical drops on the other side of the climb. Once I learned to trust the bike and keep the throttle open, the incredible amount of grip the knobbies provided in the sand was uncanny. But to a large extent, I was still relenting control to the motorcycle to follow the path it chose, as I simply didn’t have the skill nor the confidence to wrestle the bike around and make it dance to my every command. At the end of our second 20-minute session, there were some aches and pains following the crash, but I certainly wasn’t as beat as I was after the first session. Now I’d like to brag about the fact that I got to ride the TVS Sherco RTR 450 - the big daddy - the Dakar bike. But after looking at the riding abilities that most of us exhibited, the good folks at the TVS Sherco racing team decided that it was best to let us have just a short spin on it on the hard packed sand near the bivouac. And it’s probably a good thing, as none of us wanted to have the shame of having dropped a proper Dakar bike on our resumes. From the few minutes on the bike, it became clear that it was a whole different beast - much heavier at 135kg, and even taller with a seat height of 970mm. The biggest differentiator was the extremely capable suspension with a massive 300mm of travel at the front and 330mm at the rear. While the RTR 450 was a lot more comfortable to sit on than the other bikes, it did feel more akin to a large adventure bike when trying to get it to turn. But apart from that, all I can add is that it felt like a severely beefed up version of the 450 enduro. 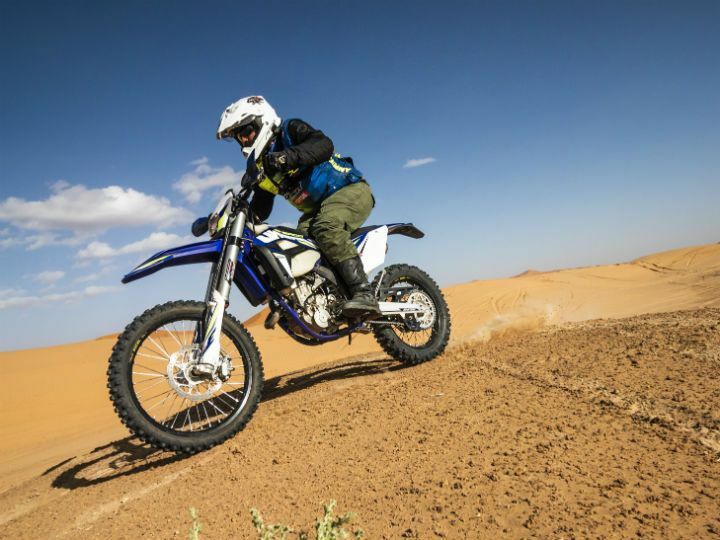 However, the bike that really impressed the most was the 450 Rally Lite - the same bike that Tanveer rode to his second-place finish in the Enduro category of the Rallye du Maroc. There wasn’t too much to tell it apart from the 450 SEF at first glance, except for the large navigation tower at the front of the bike and the auxiliary fuel tank at the rear. But closer inspection revealed that this was running on rally-spec MAC suspension. Again, we didn’t spend too much time riding this bike, but with nearly the same lightness as the standard Enduro and finely tuned suspension, it just glided over the sand as if we were riding on a slightly bumpy road. Even landing jumps didn’t faze the bike one bit. But the bike did demand our full attention, as it felt much more aggressive in its response compared to the SEF. Honestly, I wish I could’ve waxed lyrical about how all these bikes handled, and how capable they were over the sand dunes, but the delta between bikes’ and my abilities was so high, that I was just left with a sense of amazement at the end of ride. Amazed at just how low both my mental and physical fitness levels are to handle such riding, but more amazed at just how these rally guys can race these bikes, over such terrain, at full chat at days on end. Much respect!